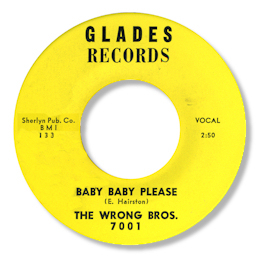 This 45 is one of the most obscure releases on Henry Stone’s Glades label – and both sides have considerable merit. “All I Want Is You” is a good slice of uptempo soul, with an almost R & B feel especially in the horns. But of course I prefer the down tempo Baby Baby Please which features some wonderful testifying vocals as the guys trade verses supported by a female chorus. A strong arrangement is matched by just the sort of mix I like – with the horns right up front. I’d love to hear from anybody with info on who the Wrong Bros were. Note ~ “Baby Baby Please” can be found on the SFTV CD “A Deep Dip Into Florida Soul”.